July 3, 2015. Sharks fans, remember this date: it was on this day that Sharks’ general manager Doug Wilson made a brilliant signing (at least in my mind). Wilson signed free agent forward Joel Ward to a three-year contract. Ward brings toughness, scoring (he’s capable of surpassing the 40 point plateau as he did previously in 2013-14), and versatility to this already talented club. He can play on the 2nd powerplay unit (he was 3rd on the Washington Capitals in power play goals last season with 6), kill penalties, and he’s an absolute beast in the playoffs (in 53 career NHL playoff games, he has 35 points). Although older at 34 years of age, Ward is exactly what the Sharks need at this time to round out their group of forwards. Marleau, Couture, and Ward on one line? Man, that’s just scary. The signing of defenceman Paul Martin in the offseason was a very intelligent transaction as well. Martin, a seasoned veteran, is a very solid defensive player. Last year he lead the Pittsburgh Penguins in plus/minus with a rating of +17. He also sports a career plus/minus rating of +100. Pretty impressive. Martin is capable of putting some points on the board too as he’s reached the 20 point plateau in 9 of his 11 NHL seasons. The experience and maturity that Martin will bring to the Sharks both on and off the ice will be invaluable. Expect him to play on the team’s top defensive pairing, logging over 20 minutes a game. The Sharks traded a first-round 2016 draft pick and a prospect to the Boston Bruins in exchange for Martin Jones this summer. With Antti Niemi signing with the Dallas Stars, another competent goalie was needed to replace him. Mark my words: Martin Jones is a #1 goaltender. 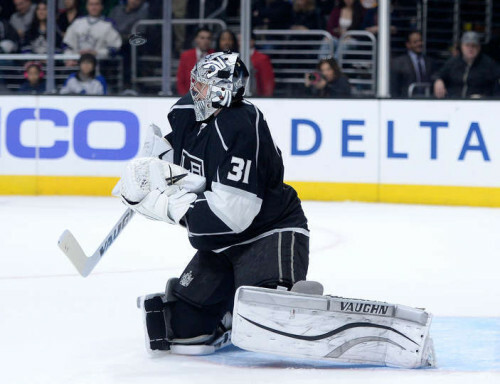 After sitting on the bench and watching Jonathan Quick make some unreal saves for the majority of 2 seasons with the Los Angeles Kings, Jones is ready to be the go-to guy. In 34 career NHL games, he has 16 wins, and sports a save percentage of .923 and a goals against average of just under 2 (1.99). Those are some fine looking numbers. Young, agile, and determined in the net, Jones most certainly has the potential to carry San Jose this season. With Todd McLellan no longer behind the bench, it will be interesting to see if and how the Sharks’ power play is affected. During his time as head coach, McLellan implemented a very successful power play system: in his 7 seasons with the franchise, San Jose finished in the league top 7 in power play percentage 6 times with a success rate of over 20% in each of those seasons. Was this success predominantly a result of his system? We’ll soon find out. Fired mid-season as bench boss of the New Jersey Devils in 2014-15, Pete DeBoer is excited to hopefully achieve success this season with the Sharks. In his 7 seasons coaching in the NHL, DeBoer has only one playoff appearance on his résumé (back in 2011-12 when the Devils reached the Stanley Cup final). In his defence, the teams that he’s coached have not consisted of particularly strong rosters (the Florida Panthers from 2008-2011 and the New Jersey Devils from 2011-2015 – minus the aforementioned 2011-12 team). DeBoer has however coached the Kitchener Rangers to a Memorial Cup in 2003, an OHL Championship in 2008, and won a gold medal with Canada at the 2015 IIHF World Championships as an assistant coach. DeBoer has stated this his focus in San Jose will be on the little things within a system such as applying additional pressure in all 3 zones, more so than on a system itself. This mentality may be precisely what the Sharks desperately need to reach that next level of success. Really though, can that thing possibly get any more full?! We’re all just dying to see if Burnsie can outdo himself this year. Little Joe (Joe Pavelski) – the man drafted in the SEVENTH round in 2003 – will be wearing the “C” this season. Excellent player, excellent attitude, excellent decision. Although currently day-to-day with an undisclosed injury (ugh, does that term ever get any less annoying? ), Karlsson will likely reclaim his spot on the top line upon returning. The chemistry he, Thornton, and Pavelski established was off the charts. As a rookie last season, the 25 year old collected 24 points in 53 games. Look for him to a have a solid sophomore season and for his numbers to increase. 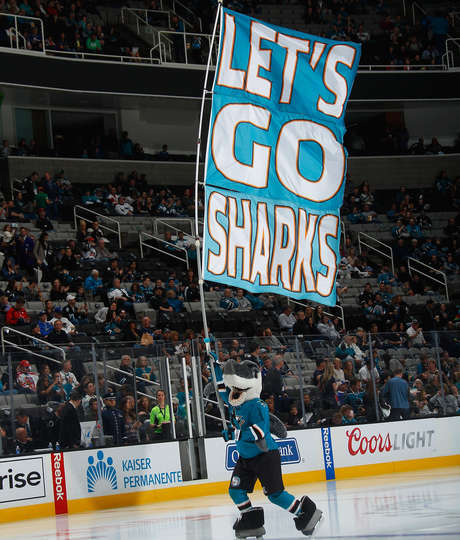 The Sharks will finish somewhere within the 5-8 spot in the Western Conference, solidifying a playoff berth for the 9th time in the past 10 years. This team is stacked with high-end talent upfront yet again this year with the likes of Joe Pavelski, Joe Thornton, Patrick Marleau, and Logan Couture leading the way. 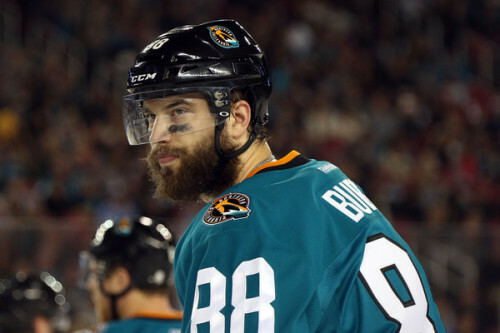 With Brent Burns, Marc-Edouard Vlasic, and Paul Martin on the back end, defence should not be an issue either. If all goes according to plan, Martin Jones will establish himself as a reliable starting netminder. I predict that San Jose will advance to the 2nd or 3rd round of the playoffs, but may have some difficulty should they run into the Anaheim Ducks, Chicago Blackhawks, or Los Angeles Kings. Go Sharks!